Just because I stock my closet full of neutral colors, shapes, styles galore - does not mean that the pieces have to be dull and boring. Quite the contrary actually. Pieces like this T by Alexander Wang dress are basic in theory but the literal twist in the front gives it the figurative twist that I look for in clothes. With a cap sleeve and mock t-neck, this piece has legs for many seasons to come. It can just get right up and walk its way through my closet year after year, showing up in Winter or Summer, Fall or Spring. And since the dress falls at such a modest length - I enjoy throwing a harsher piece of jewelry with it to create some contrast. You know - like that Duane Reade bag is perfectly contrasting my hand-on-hip made up fashion photo shoot. Stay classy New York. But back to the accessories! 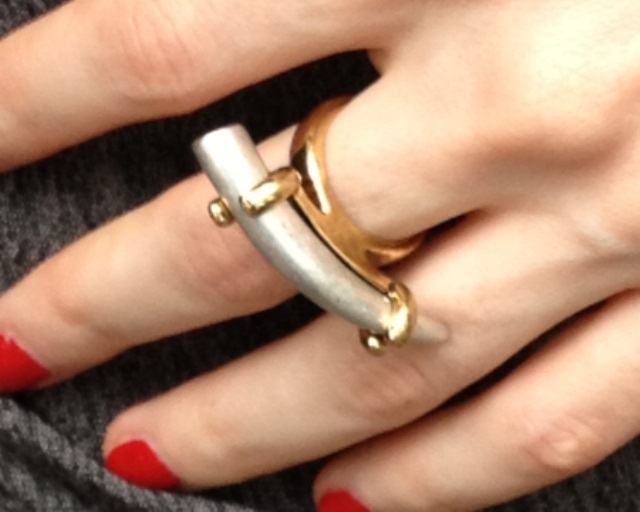 This horn ring fits the bill perfectly and I enjoy that it is both silver AND gold - defying that stupid jewelry rule. Who made that up? Does that person also not wear brown and black together? And perhaps still have an answering machine? Yeah - I thought so. My of-the-moment self wants to extend a hand out to them and welcome them to 2012. A time when its ok to mix things up and take some risks. If you know anything about my blog (and you should! shame on you. ), you know that I am not about making rules for fashion or creating boundaries that only exist to box you in. I mean - don't start wearing your underwear outside of your pants and cite my blog as the reason - I don't need my Barney's membership revoked, thank you very much. But taking a sartorial chill pill wouldn't hurt - hell it might even make getting up in the morning a little less awful because you put the fun back in getting dressed. A little less. I can't work miracles people. What risks are you taking in fashion this fall? Maybe I want to take them too. Let's do it together. Leave me a comment below and let me know. Do you look HOT or do you look HOT in this dress? I love it!